This is the final film in Inagaki’s epic trilogy adapting Eiji Yoshikawa’s biographical novel of the early life of Musashi Miyamoto, the exemplar of Bushido. It leads up to the inevitable duel between Musashi (Toshiro Mifune) and his arch-rival Kojiro Sasaki (Koji Tsuruta), introduced in the previous movie. But more than that, the purpose of this film is to draw a contrast between the vainglorious Kojiro and the increasingly humble and thoughtful Musashi. It does this from the very beginning, the first scene showing Kojiro at a waterfall, a location of great natural beauty, ignored by the samurai who sees a passing swallow as nothing more than a challenge to his sword-skill, as he brings it down with a single lightning stroke. Musashi, on the other hand, when challenged by a boastful spear-wielding monk, declines to draw his own sword, and instead neutralizes his opponent by grabbing the end of his spear and using his own strength against him. Musashi’s idea of further training is to return to the simple life of the soil. He becomes a farmer at a village where the peasants, repeatedly raided by bandits, are giving up in despair. But the complications of his old life pursue him into the countryside: Otsu (Kaoru Yachigusa), who’s loved him since he was a youth, shows up at the village, as does the bandits’ moll Akemi, who also pines for Musashi. Jealous of Otsu, she calls the bandits down on the village, and Musashi must fight to defend the peasants. Finally the reckoning with Kojiro can be put off no longer. 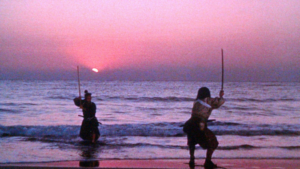 Inagaki’s depictions of the fights in this film are impeccable, but the final duel at dawn on the beach at Ganryu Island is a thing of beauty, a ballet of light, water, and weaponry, a few simple elements the director combines into a scene both elegant and unforgettable, exemplifying all that’s gone before. I think I’ll go watch it again.